Thank you for the great response to the framed intaglios GIVEAWAY. I have been working on over-drive to get these ready for the party. There is still time to join the Holiday Dining party and to enter the giveaway. right now, but I promise to reveal the entire room after Christmas. 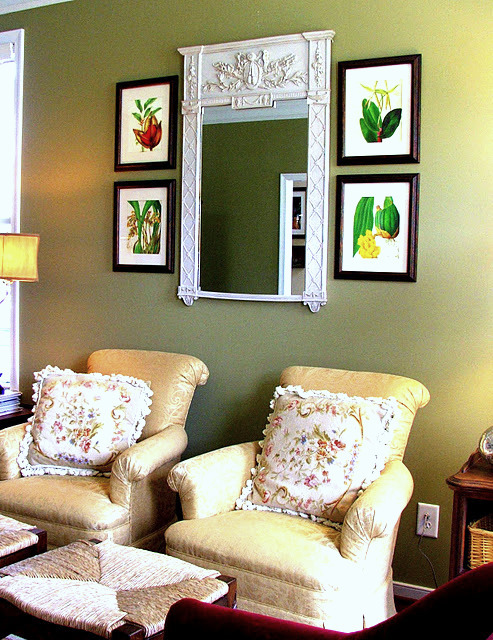 This is how the wall looked previously with the framed botanical prints. crossed the automated publishing works! They look beautiful, and so is your mirror! I hope you have a wonderful trip, and I'm off to enter the Giveaway! They look wonderful there next to that beautiful mirror! Your new pictures look so pretty! I really love those. They look great around that pretty mirror. Can't wait to see the room when it's ready for its reveal. BEAUTIFUL Sherry!! 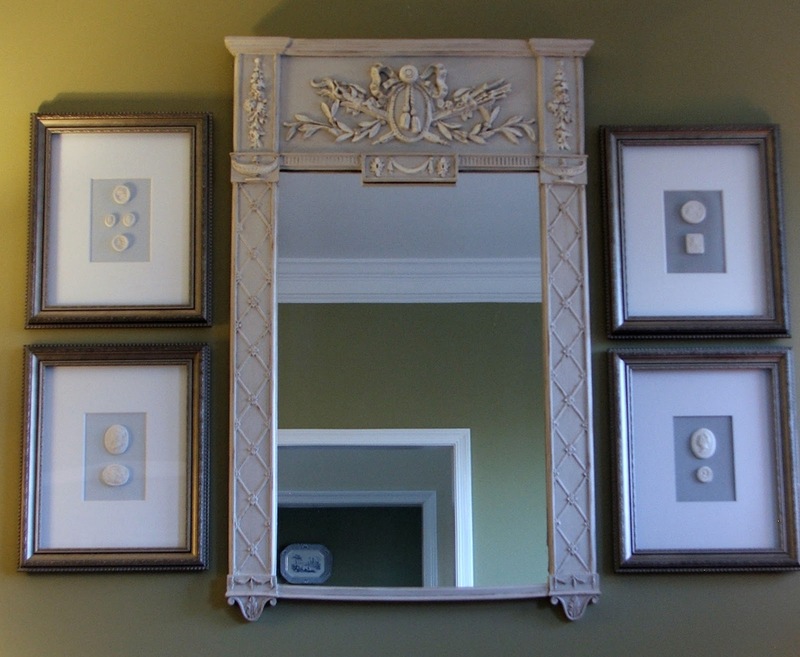 I love how you grouped them around the mirror, so well done. Sherry your intaglios look fabulous! I hope you enjoy your visit! Thank you for stopping by because now I have your blog to visit too! I love the intaglios, they look great in your living room. The look beautiful, Sherry. They are fabulous hung next to the mirror. Can't wait to see what else is going on! I was thing of doing a tour of my living room, but now I think not. Very nice, those intaglios look like they were designed to be with that mirror frame. You did a wonderful job creating and displaying them. Thanks for stopping by my blog. I am now following your blog as well. It appears we are both crazy about antiques as well as the hunt for unique old objects. By the way, I loved the intaglios you just displayed on your wall and the contrast with the green walls. Sounds like you like changing your decorating often as well. I'm sure we have a lot in common. Your home is looking just beautiful!!! I love your Intaglios, you did an amazing job on them!! I'm so excited to see that your opening up an on-line shop!! Looks really smart, Sherry! Love it! Oh, how I love intaglios….especially framed ones! Love all your trees too. Christmas is looking good in your lovely home!